The Woda Group, Inc., breaks ground at affordable communities in Rocky Mount and Zebulon, NC. Westerville, OH, November 16, 2017 –With heavy equipment parked and ready to begin construction work, The Woda Group, Inc. hosted groundbreaking events November 14, 2017, at two sites in North Carolina. A morning event was held at Ravenwood Crossing, a new $9 million development in Rocky Mount, adjacent to the South Rocky Mount Community Center. Ravenwood Crossing will create 80 new affordable townhomes for seniors, families and singles. Units will feature bright, open-concept living spaces, washer-dryer hookups, Energy Star appliances and covered porches. Amenities include a community building with management offices, a multipurpose room, laundry, fitness center and computer rooms. Several units will be handicapped accessible and there will be an outdoor play/picnic area. In addition to a morning groundbreaking ceremony, an informal family event was held later in the day. Financing for Ravenwood Crossing is made possible by federal affordable housing tax credits and other state loans allocated by the North Carolina Housing Finance Agency. The City of Rocky Mount also supported the development, including a $250,000 HOME loan. CAHEC is providing the equity by acquiring the affordable housing tax credits and the Bank of Tennessee is providing the construction loan and permanent loan financing. A second groundbreaking event was held at Shepard Greene, a new $6.4 million affordable rental community for seniors in Zebulon, NC. Shepard Greene will offer seniors (age 55 and over) 50 affordable homes with bright, open-concept living spaces, individually-controlled heating and air conditioning, washer-dryer hookups and Energy Star appliances. Amenities include a multipurpose community room, laundry, laundry, fitness center, computer room and outdoor sitting area. Several units are handicapped accessible. Financing for Shepard Greene was also made possible by federal affordable housing tax credits and other state loans allocated by the NC Housing Finance Agency. Bank of America is providing the equity by acquiring the affordable housing tax credits and will also provide construction financing. A USDA Rural Development 538 loan will be implemented by Bellwether Enterprise. Mayors of both cities participated in the respective events. Rocky Mount’s Mayor David Combs said there is great demand for affordable housing in the community of 55,000 located across the border of Nash and Edgecombe counties. He said Ravenwood Crossing is an important step in “transforming” the South Rocky Mount neighborhood anchored by the Community Center. Zebulon’s Mayor Bob Matheny extended a warm welcome to Shepard Greene as well. “This will be a real asset to the community and we really appreciate your confidence in our town with your investment here,” he said. Zebulon, with an approximate population of 4,400, is located in Wake County and part of the state’s Research Triangle area. Betty Jo Shepheard represented North Carolina’s U.S. Senator Richard Burr at both groundbreaking events, pledging the senator’s support for the continued development of affordable housing. “Senator Burr will continue to advocate for and support affordable housing and tax credits,” she said. Denis Blackburne, Senior Vice President of The Woda Group, Inc., thanked supporters for both developments. 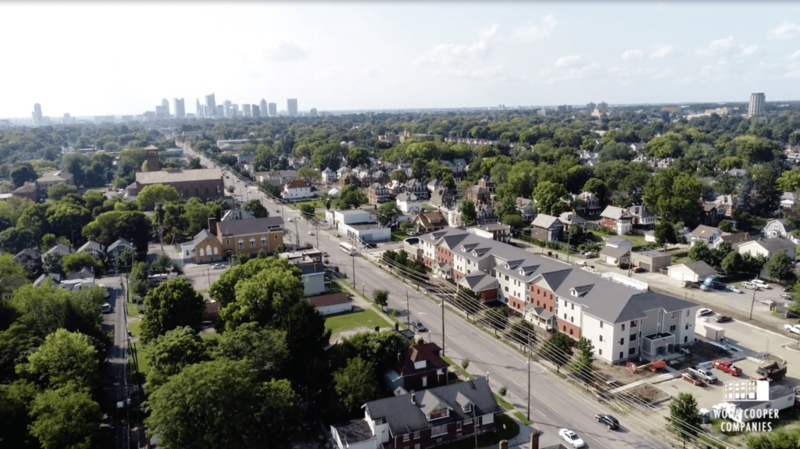 “In order to build the 80 multi-family homes at Ravenwood Crossing, and 50 senior homes at Shepard Crossing, it takes tremendous cooperation with the cities, the housing agency and the funding partners, to plan the development and put together the necessary resources to construct these high quality affordable housing communities,” Blackburne said. Construction at both developments is expected to be completed in late 2018. In addition to The Woda Group, Inc.’s headquarters in Westerville, Ohio, the firm has offices in: Annapolis, Maryland; Savannah, Georgia; Shelbyville, Kentucky; Norfolk, Virginia; Indianapolis, Indiana; and Mackinaw City, Michigan. For more information, visit www.wodagroup.com or call 614-396-3200. Groundbreaking ceremony at Shepard Greene in Zebulon, NC. Groundbreaking ceremony at Ravenwood Crossing in Rocky Mount, NC. Mayor David Combs with Bruce Watts and Denis Blackburne of The Woda Group, Inc.